Enjoy the top 190 famous quotes, sayings and quotations by Kathryn Stockett. Ever morning, until you dead in the ground, you gone have to make this decision. You gone have to ask yourself, Am I gone believe what them fools say about me today? I started writing it the day after Sept. 11. I was living in New York City. We didn't have any phone service and we didn't have any mail. Like a lot of writers do, I started to write in a voice that I missed. But certainly in my grandmother's time - and when I was growing up, yeah, Demetrie's bathroom was on the side of the house, it was a separate door. Still, to this day, I've never been in that room. I come home that morning, after I been fired, and stood outside my house with my new work shoes on. The shoes my mama paid a month's worth a light bill for. I guess that's when I understood what shame was and the color of it too. Shame ain't black, like dirt, like I always thought it was. Shame be the color of a new white uniform your mother ironed all night to pay for, white without a smudge or a speck a work-dirt on it. “Baby Girl," I say. "I need you to remember everything I told you. Do you remember what I told you?" She still crying steady, but the hiccups is gone. "To wipe my bottom good when I'm done?" "No, baby, the other. About what you are." I look deep into her rich brown eyes and she look into mine. Law, she got old-soul eyes, like she done lived a thousand years. And I swear I see, down inside, the woman she gone grow up to be. A flash from the future. She is tall and straight. She is proud. She got a better haircut. And she is remembering the words I put in her head. Remembering as a full grown woman. And if your friends make fun of you for chasing your dream, remember-just lie. “I'm pretty sure I can say that no one in my family ever asked Demetrie what it felt like to be black in Mississippi, working for our white family. It never occurred to us to ask. It was everyday life. It wasn't something people felt compelled to examine. Bosoms," she announces, with a hand to her own, "are for bedrooms and breastfeeding. Not for occasions with dignity." "Well, what do you want her to do, Eleanor? Leave them at home? President Kennedy's assassination, less than two weeks ago, has struck the world dumb. It's like no one wants to be the first to break the silence. Nothing seems important. I slip off my flats and walk down the front porch steps, while Mother calls out for me to put my shoes back on, threatening ringworm, mosquito, encephalitis. The inevitability of death by no shoes. Death by no husband. I shake my head at my friend. "Not only is they lines, but you know good as I do where them lines be drawn." Aibileen shakes her head. "I used to believe in em. I don't anymore. They in our heads. People like Miss Hilly is always trying to make us believe they there. But they ain't. A course we different! Everybody know colored people and white people ain't the same. But we still just people. “What should we do about it?" asks Miss Celia. 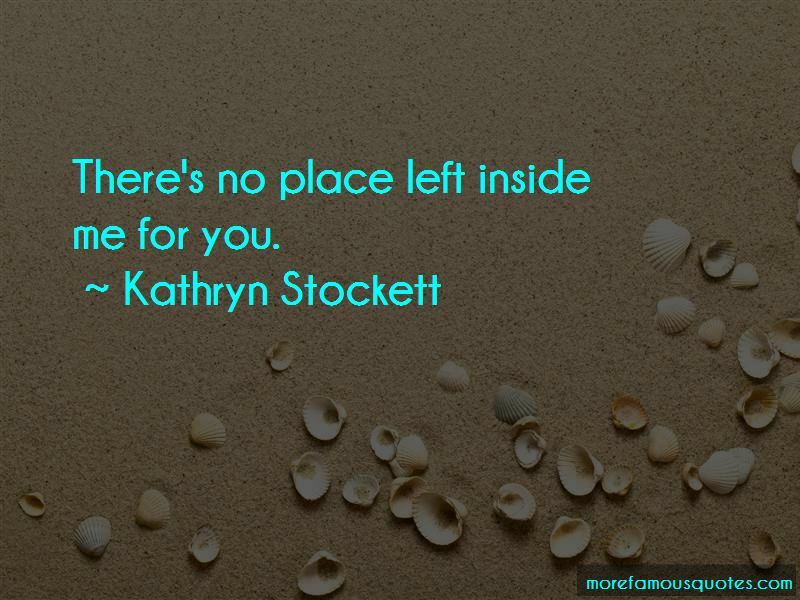 Want to see more pictures of Kathryn Stockett quotes? 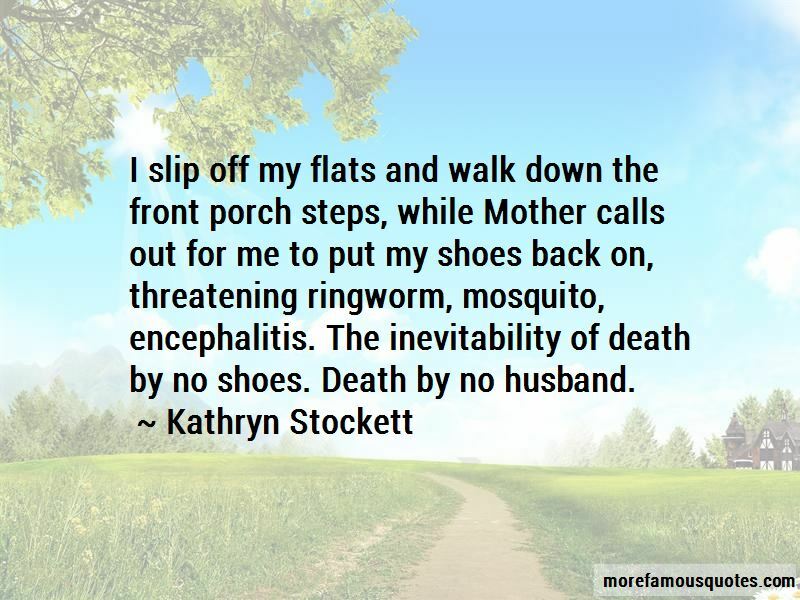 Click on image of Kathryn Stockett quotes to view full size.